The summer break can seem decades away for students in the midst of the winter blues and a hectic exam season. Students are, however, already on the hunt for the perfect summer job. Christine Colosimo, career advisor at Humber’s Career Centre, said that now is the perfect time for students to start their search for summer jobs. “Employers are hiring now, they aren’t hiring in May,” Colosimo said. Colosimo said this year’s Humber Summer Job Fair had a huge turnout of students, with around 600 students checking out the booths of 30 employers. She recommends that students do their research, come prepared with updated resumes printed and meet with employers while looking as professional as possible. Chante Morgan, events coordinator with the Career Centre, noted two important things for making a good impression on an employer. “Definitely eye contact and a firm handshake,” Morgan said. She also had advice for students seeking summer employment. “The earlier the better because by the time it gets close to the summer a lot of the good jobs are gone,” Morgan said. “When you’re approaching an employer make sure you know what the employer is all about,” Colosimo said. “We have a very active portal where employers are posting summer jobs all the time. Be active checking out that. Figure out where you want to work and do your research,” Colosimo said. The Career Centre also has a social media expert who puts on boot camps for students throughout the year to help them maximize their online profiles while trying to get employed. One of these workshops is the LinkedIn boot camp. She said employers have told her they conduct 85% of their hiring through LinkedIn. Colosimo discussed a situation where an employer met an Economics student at a job fair, had a great connection and they started to exchange messages. “On his Twitter he started rambling about a party and what he did at this party on the weekend,” she said. “And that employer of course got his Tweet…And it was (a major Canadian bank) and this was a kid that was just about ready to graduate from one of the economics programs, so he got burned,” Colosimo said. Maria Alvarez, third-year Justice Studies, said she doesn’t use career related sites such as LinkedIn. “I don’t know how to use them. I don’t know how to do it,” Alvarez said. Alvarez said she would be interested in getting help from the Career Centre in creating a LinkedIn account because she felt that she is missing out on ways to contact employers. 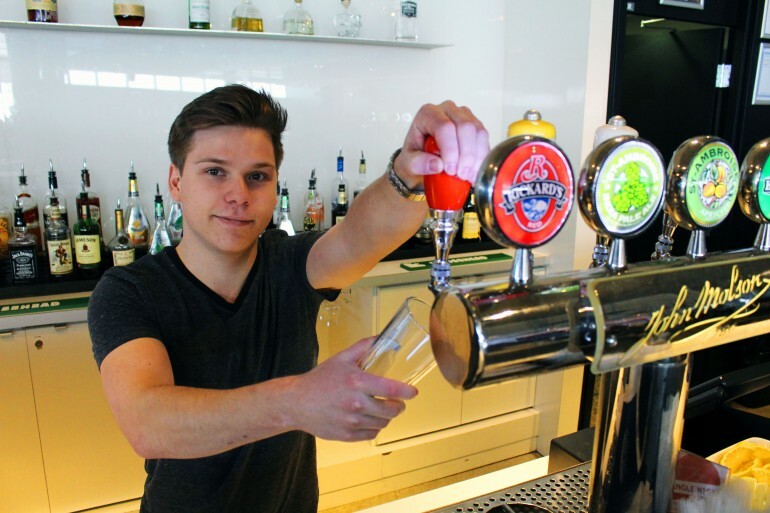 Patrick Askin, a third-year Justice Studies student at University of Guelph-Humber, has a goal of working at a bar during the summer. Askin said he has a LinkedIn account but hardly uses it. Askin said based on his past experiences applying to summer jobs, January and February are the best times to begin contacting employers. Resume critiquing, resume tutors, mock interviews, and other resources are among the many services offered by the Career Centre. Written by: Ryan on February 13, 2015. This entry was posted in Humber College, Humber Et Cetera, Writing Portfolio and tagged article, articles, humber, humber et cetera, student newspaper. Bookmark the permalink.